Cutting building materials is a common task. It’s an everyday part of the job for quarry workers, stonemasons, builders and construction workers. Many of the materials used contain high levels of a substance called crystalline silica. These include concrete, sandstone, granite and brick. When these materials are cut, the dust created will contain tiny particles that can be breathed deep into the lungs. This dust is called ‘Respirable Crystalline Silica’ (RCS). Once in the lungs, they cause serious permanent damage to your health. The images below show the dramatic effect of using water to suppress dust when cutting stone or a similar material. 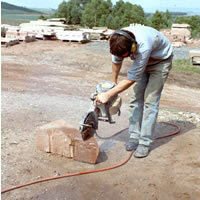 In this picture, a worker is cutting a block of stone using a petrol engine driven cutting disc. When the cutter is used dry, a great deal of dust is created. The worker is at risk of breathing in this dust, as is anybody else working nearby. This is clearly a very dangerous thing to do. In this picture, a hose has been connected to the cutter. This supplies water to jets spraying onto the cutting blade. Almost no visible dust is produced! This approach can also save you money - the tool lasts longer as the wheels/discs are kept cooler and lubricated and less dust gets into it. But be warned! Even if you cannot see the dust there may be enough to cause you some harm. 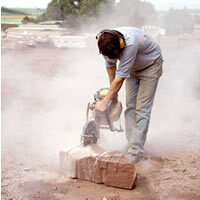 Always wear Respiratory Protective Equipment (RPE) when cutting stone.